Do ya need a laugh? Come out next Friday night! First, my Gilmore Girls scene is online now! If ya want to see it, click here! I had a blast performing with two Tony award-winning actors Sutton Foster and Christian Borle! 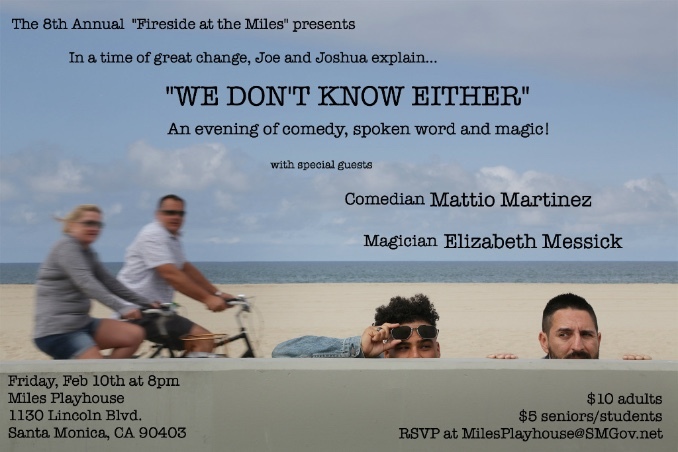 Second, my comedy partner Joshua Silverstein and I are hosting a fun show next Friday night in Santa Monica! We will perform along with comedian Mattio Martinez and magician Elizabeth Messick! Lastly, I was part of a fun web project called "RILEY: The Series." Click here to subscribe and watch the premiere episode! Click here to watch the trailer! Come to our show next Friday night! I hope that everything is going well in your life! Newer PostRiley The Series & Princeton Latinos! Older PostLet the binge-watching begin! Joe's on "Gilmore Girls!"